Premium vodka brand Grey Goose have taken the headache out of superyacht party planning for would-be hosts in Ibiza this summer with a pop-up party service. Created in collaboration with luxury lifestyle service Ibiza Delivers, the scheme is available for both yachts and private villas. Hosts simply choose one of the three packages on offer and the team will have your yacht ready for the ultimate summer celebration within just four hours of ordering. All three packages include a fully stocked bar, mixologist, wait staff, extra deck chairs and loungers and elegant party decorations. The bar will offer a variety of four bespoke vodka cocktails, including Le Fleur (vodka, elderflower and rose pressé, rose water and fresh lime) and the Ibiza Berry (vodka, raspberry lemonade, fresh lemon and berry garnish). Each party also comes complete with a seven-hour set from the DJ of your choice with decks and sound booth provided. Depending on the selected package hosts can choose from local DJs, such as Dan Kelly, Trevir O’Neil and Lisa Chasserton, up to renowned international artists including Robert Miles, Nightmares on Wax and Alfredo. With its reputation as the party capital of Europe, any bash thrown in Ibiza has to be pretty spectacular. If you want to host a memorable celebration on your perfect party yacht but don’t want your crew bothered with the hassle of event planning then this is the ideal answer. 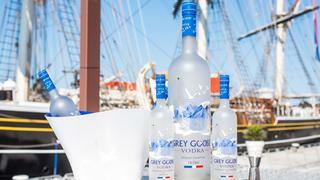 The Grey Goose Ibiza Delivers Pop-Up Party service is available now from €5,685. Visit greygoose.com for more information.